HAVE YOU SEEN Mel Gibson’s movie The Passion of the Christ? It’s like none other I’ve seen. It details the horrifying pain and anguish Jesus suffered in the final hours of His earthly life. By now, millions of viewers around the world have been moved beyond words by the graphic depiction of that violent and shockingly torturous ordeal. People of all ages, cultures, and races have looked on in alarm and disbelief as vivid scenes from the sacred story relentlessly rolled on, growing increasingly more bloody and intense. The film has stirred controversy that is unprecedented in recent history. But why? Why such shock at a story that has been told for centuries? Why the outrage over Gibson’s violent interpretation of Christ’s final days? I would answer, because the film depicts and supports God’s revealed Word. Many prefer to think of Jesus as meek and mild and gentle at heart. They find quiet rest in the loving Shepherd of Israel, who smiles at children, heals the sick, feeds the hungry, and speaks softly of a kingdom not of this world. Few wish to go much further. They resist embracing His inconceivable pain—His excruciating humiliation, that culminated in a horrible death at the hands of unjust men bent on cursing, cruelty, misery, and murder. No one wishes to dwell on such abject evil. Yet that is precisely how the Scriptures portray Jesus—a “man of sorrows and acquainted with grief ” (Isaiah 53:3). The Bible swells with more appealing and endearing prospects of the Savior. They are the names we love to let fall from our lips in song and in prayerful devotion: Prince of Peace, Lord of Hosts, the Good Shepherd, the Great Physician, Morning Star, Lion of Judah, Lamb of God. But Man of Sorrows? That doesn’t sound like anyone we’d care to get close to, does it? Until we find ourselves in the crucible of the tough stuff of pain. Enveloped in a world of hurt, broken by life’s brutal blows, we discover He’s everything we need. Long before Mel Gibson even thought about making a movie that dramatically focused on the passion of Christ, the prophet Isaiah wrote his original script. It would serve as the basis of a drama to unfold nearly eight centuries later. Isaiah, under the inspiration of the Holy Spirit, wrote of God’s promised Messiah—the One above all others who understands your pain and mine—the Man of Sorrows. Normally we don’t think of the Messiah in terms of weakness, sadness, deep sorrow, and grief. Yet Isaiah describes Him precisely in that manner, using just about every synonym available for suffering. Read slowly and thoughtfully the ancient prophet’s penetrating prophecy. But the Lord was pleased to crush Him, putting Him to grief. . . . As a result of the anguish of His soul, He will see it and be satisfied; by His knowledge the Righteous One, My Servant, will justify the many, as He will bear their iniquities. (vv. 10–11) That doesn’t sound like a milquetoast Messiah to me, wouldn’t you agree? No, Jesus endured, and therefore He understands the depth of human pain and suffering. Look again at a list of Isaiah’s words: despised, griefs, sorrows, crushed, oppressed, afflicted, scourged, pierced through, smitten, stricken, like a lamb led to slaughter. Today we would say, He’s been there . . . done that, even though we don’t like to think about it. We like to think of Messiah as winning, not losing. We want to see Him in white garments coming on a white horse. We like Him to be conquering and victorious. But that is not the way He was predicted to be. The writer of the New Testament book of Hebrews picks up the theme of Christ’s suffering when he writes, “In the days of His flesh, He offered up both prayers and supplications with loud crying and tears to the One able to save Him from death, and he was heard because of His piety” (Hebrews 5:7). I find that to be a remarkably comforting thought. The Son of God, in all His deity, being also fully human, felt the sting of impending death and called on His heavenly Father for comfort and help. Stop and think about what you’ve just read. All of it has to do with pain—that four-letter word from which we try our best to escape. But Jesus deliberately did not choose that route. He accepted the pain, He endured it, and He embraced it. Webster’s Dictionary defines physical pain as “a basic bodily sensation induced by a noxious stimulus, received by naked nerve endings, characterized by physical discomfort . . . acute mental or emotional distress” (Webster’s New Collegiate Dictionary, s.v. “pain”). Jesus knew such physical and emotional pain, as we shall discover in the pages that follow. Being the Man of Sorrows that he was, He understands and identifies with our deepest hurts and struggles. If there is anyone who can meet you in your pain, you have found Him in the prophet Isaiah’s Man of Sorrows. You and I enter this world screaming. Physicians tell us that one of the first signs of good, healthy lungs in newborns is that initial, piercing cry. The tiny child whose little frame has only moments before squeezed its way through a narrow birth canal screeches in pain when it leaves the warmth of the womb and emerges with a gush into the cold, cruel world—a world of pain. From the moments we’re born until our final breaths, pain is our companion, albeit one we’d choose to abandon. Still, pain does have its benefits. Physically, for instance, pain signals unseen trouble, and it helps caring mothers and physicians pinpoint the problem. Personally, just like Christ, we learn obedience from the things we suffer (Hebrews 5:8). Spiritually, the pain of adversity helps us grow into mature people of faith (James 1:2–4). “I have never read a poem extolling the virtues of pain, nor seen a statue erected in its honor, nor heard a hymn dedicated to it. Pain is usually defined as “unpleasantness.” Christians don’t really know how to interpret pain. If you pinned them against the wall, in a dark, secret moment, many Christians would probably admit that pain was God’s one mistake. He really should have worked a little harder and invented a better way of coping with the world’s dangers. I am convinced that pain gets a bad press. Perhaps we should see statues, hymns, and poems to pain. Why do I think that? Because up close, under a microscope, the pain network is seen in an entirely different light. It is perhaps the paragon of creative genius (Philip Yancey. Where Is God When It Hurts? Grand Rapids: Zondervan, 1977, 1990, pp. 22-23). Emotional or mental pain is not quite as objective. Almost always on target, C. S. Lewis adds this comment, “Mental pain is less dramatic than physical pain, but it is more common and also more hard to bear. It is easier to say ‘My tooth is aching’ than to say ‘My heart is broken.’ . . . Sometimes, however, it persists, and the effect is devastating” (C.S. Lewis. The Problem of Pain. New York: Collier Books, Macmillan Publishing Company, 1962, p. 156). I love that quote! In other words, it’s hard enough to go to a dentist when I have a bad tooth, but where do I go with this broken heart? I suggest the answer is not that difficult: We go to Jesus, the Man of Sorrows, who is acquainted with grief, who understands our brokenness and pain. Pain has a way of turning us back to the Savior. That makes it essential for our growth and spiritual well-being. If you’re feeling despised, forsaken, rejected, crushed, or afflicted, Jesus understands (Hebrews 4:15). To what degree does He understand? To answer that, let’s revisit those final hours of Jesus’s life and look closely at the categories of pain He suffered. At the commencement of Christ’s ministry John the Baptist pointed to Him and said, “Behold, the Lamb of God who takes away the sin of the world!” (John 1:29). I’ve often imagined the dull sense of dread those words must have sent through Christ’s soul—knowing He’d one day be the actual “Lamb led to the slaughter.” Yet His physical suffering was only a portion of the cup of suffering He would be compelled to drink. Matthew 26:30 tells us that Jesus and His disciples had just completed their final meal together, which they ended by singing a hymn. That must have been an extremely emotional time for the Savior, as He reflected on the torturous anguish He’d soon endure and those He’d be forced to leave behind. The men He had lived among for so many months knew nothing of what would soon unfold. But Jesus knew what was ahead of Him from that moment all the way to the cross. If there was ever a time when He needed the strong support of His closest friends, it was in those ominous hours in Gethsemane. Then Jesus came with them to a place called Gethsemane, and said to His disciples, “Sit here while I go over there and pray.” And He took with Him Peter and the two sons of Zebedee, and began to be grieved and distressed. Then He said to them, “My soul is deeply grieved, to the point of death; remain here and keep watch with Me” (Matthew 26:36–38). Gethsemane. The word means “oilpress.” Symbolically it is easy to see how it represents those places of deep, pressing pain and mental agony. We each have our own Gethsemane to endure. Perhaps you are in the depth of yours today. Maybe not; for you it could be in the future. Maybe you’ve passed through one and before you could catch your breath you’ve entered another. It’s always something! It’s at those times that having a few close friends means the most. We lean on them and draw strength from them. In one of the most intimate scenes from Jesus’s life, Matthew writes of the Savior inviting His closest friends to remain with Him as a ready source of encouragement and support: “And He went a little beyond them, and fell on His face and prayed, saying, ‘My Father, if it is possible, let this cup pass from Me; yet not as I will, but as You will’ ” (v. 39). Christ’s pain was so intense He pleaded with His Father for a way out of it. Don’t hurry over that. In Luke’s Gospel, we’re told that Jesus prayed with such intensity that He dripped sweat that “became like drops of blood” oozing from his skin and falling to the ground (Luke 22:44). Drenched in pain’s agony, Jesus returned to His friends in hopes of finding some needed encouragement. But in that time, when He needed them the most, His disciples failed Him miserably. Read carefully through this tender but convicting scene, and allow Matthew’s words to touch you deeply. Let your heart be broken. And He came to the disciples and found them sleeping, and said to Peter, “So, you men could not keep watch with Me for one hour? Keep watching and praying that you may not enter into temptation; the spirit is willing, but the flesh is weak.” He went away again a second time and prayed, saying, “My Father, if this cannot pass away unless I drink it, Your will be done.” Again He came and found them sleeping for their eyes were heavy. And He left them again, and went away and prayed a third time, saying the same thing once more. Then He came to the disciples and said to them, “Are you still sleeping and resting? Behold, the hour is at hand and the Son of Man is being betrayed into the hands of sinners. Get up, let us be going; behold the one who betrays Me is at hand!” (Matthew 26:40–46). Each time Jesus returned to His friends, they lay snoozing in the grass. What a pathetic scene. To make things worse, as we saw in the previous chapter, one of His close companions stood ready to betray Him publicly. Jesus knelt in Gethsemane, broken in spirit and betrayed, anguished of soul and grieving, missing the comfort of those He had mentored for over three years. Truly alone, He now experienced the deep, relational pain of failed friendships and would soon feel the kiss of the traitor. There is no place more alone than one’s own Gethsemane. Support groups are great. I believe in them and encourage every one of them in our church. But there are personal Gethsemanes you must walk through completely alone. You’ll always feel a deep loneliness while you’re getting through the tough stuff of pain. That’s when Christ will be there. Your best friends may fail you. Some will try to understand, but often they can’t. A few, frankly, will forget you. Some may turn against you. In the agony of your need for relational support, you’ll have all you need with Christ. You will find Him at those times closer than a brother. I know. He has met me in my own Gethsemanes, and He will do so again and again and yet again. A good friend of mine and former fellow church staff team member, David Carder, has spent years counseling brokenhearted people. Dave offers a rare insight into the reality of internal pain as he observes, “Knowing doesn’t automatically fix feelings.” Isn’t that an excellent insight? He endured when the zero hour arrived. Jesus had known for thirty-three years that the cup of suffering would come. Knowing all of that for so long didn’t fix His feelings of intense pain. When the full weight landed on Him at Gethsemane, He pleaded for relief. Herein lies a vital lesson for all of us: we are never more presumptuous than when we try to give hurting people the feelings we think they ought to have in their anguish. Don’t dare invade that tender, internal space! There are occasions when another’s anguish is essential for the accomplishment of God’s plan. Even though some of us wish to rescue others from pain, we need to restrain ourselves from doing so. Let’s guard against cutting in on God’s plan. Don’t try to fix people’s feelings. Our best involvement is usually to “keep watch and pray.” To stay near and be silent. To be available and to support. Jesus understands better than anyone the silent cries of your internal pain. For those who have seen The Passion of the Christ, I need not rehearse in detail the depth of physical pain Christ endured. The brutalities were horrific and like none experienced by anyone before or since. A quick glance at Matthew’s list provides an overview of the intensity of what Christ experienced physically. He was seized and treated harshly like a common criminal (Matthew 26:57). He was spit on in the face, slapped, and beaten (26:67). He was bound and scourged, according to the other Gospel writers (27:2; Mark 15:15; John 19:1). He was spit on again and mercilessly beaten with a reed (Matthew 27:30). He was crucified, spikes driven into His hands and feet, and later a sword was thrust into His side (27:33–35; John 19:34). Imagine the horror of having iron spikes pounded into your hands and into your feet. Or the excruciating humiliation of being hung naked in plain view of a gawking crowd. Insects no doubt swarmed His bloodsoaked body. It must have been a horrible event to witness, to say nothing of personally enduring it! Christ’s body had been so mutilated He didn’t even look human. The physical pain He must have borne is nothing short of mind-boggling. Still there was a pain more severe than that which He felt physically. Thankfully because of Christ it’s a pain you and I will never know. Though Christ’s relational, internal, and physical pain were horribly intense, the pain of being separated from His Father goes far beyond our ability to imagine. Matthew writes, “Now from the sixth hour darkness fell upon all the land until the ninth hour. About the ninth hour Jesus cried out with a loud voice, saying, ‘Eli, Eli, Lama Sabachthani?’ that is, ‘My God, My God, why have You forsaken Me?’” (Matthew 27:45–46). Let me assure you, you cannot have a heartache that Jesus doesn’t understand and with which He doesn’t identify. You cannot have a physical pain that somehow escapes His awareness. You cannot have a crippling disease, a disability, a grief, a heart attack…not even a debilitating fear or panic attack that He cannot understand or feel. He’s felt it all. Therefore He’s there to walk with you through your most profound depths of pain, if you’ll only let Him. Do you have a lingering scar on your heart that won’t heal? Look at His hands, His feet, and His side. Feeling humiliated and alone? He knows what that feels like. Are you so confused by your circumstances that you’re tempted to bargain with God for relief? No need. Without one word from your lips, He understands. He’s touched with the feelings of our weaknesses, and therefore He identifies with them. Perhaps you’re lonely. Your lifelong mate has gone to be with the Lord. You face an uncertain future—all alone. You may have recently been forgotten. Your parents told you to get out of their lives. Perhaps your husband or your wife just walked out for good, rejecting you for someone else. Or you may have just read a cruel letter from an adult child that included seven words you cannot bear to believe: “I never want to see you again.” Relationally, you need somebody. Internally, you’re in anguish. Physically, you’ve reached your threshold. You may be confused, living with deep emotional scars as a result of being abused. You may suffer from such a horrible and shameful addiction that you fear rejection by anyone who might discover your secret. The pain of shame grips your soul and ambushes your thoughts. Perhaps you feel helpless, enraged, confused, disappointed, depressed, misunderstood, humiliated, and at the end. Ultimately you wonder, as Jesus did, why God has forsaken you. You may feel that, but hear this: you are not alone. There is hope. There is help with the Savior by your side. I want to close this chapter [article] with several analogies I hope will provide you a measure of comfort as you walk with Christ through the tough stuff of your pain. Relationally, no one stays closer than Christ. Christ is better than the most faithful husband, more understanding than the most comforting wife, more reliable than the choicest friend. No one stays closer than Christ. There is no friend more caring. There is no person more unconditionally accepting. There is no one more available or more interested whom you can talk to in the middle of the night, or at any other time, simply by calling out in prayer. He even understands your groanings—He’s able to put correct meanings to your inexpressible moans! He has promised never to leave you. He will not walk out on you. No one stays closer than Christ. I’ll say it again: no one. your corner. His balm of comfort penetrates. No one heals deeper than Christ. Physically, no one comforts better than Christ. In the midst of your deepest physical pain, His presence brings comfort and strength. He may choose to restore your physical health, but frankly, He may not. Regardless, His grace is abundantly sufficient for you. His hand is on your life at this time of your affliction. It’s better than the hand of any friend, any partner, any parent, or any child, because when He touches, He brings great compassion and lasting relief. No one comforts better than Christ. Ultimately, no one sees the benefits of our pain clearer than Christ. He sees through the dark, winding tunnel of your Gethsemane all the way to the end. You see only the unrelenting, frightening, thick darkness. He sees beyond it into the shining light of eternity. Maturity, growth, stability, wisdom, and ultimately the crown of life await the one who trusts His unseen hand. Keep in mind, He owns the map that gets you through your Gethsemane. No one sees the benefits of our pain clearer than Christ. Whatever you’re facing today, please remind yourself that your pain is no mistake. It is no accident. In fact, your suffering may be precisely what Christ will use to bring you to your knees, to draw you back to His heart and discover His peace. “Man of Sorrows,” what a name! It’s the name of the Son of God. His name is Jesus. It’s the name that represents the extremes of pain and understanding, companionship and relief. Perhaps you have never recognized your need for a personal relationship with God, through faith in Christ. You’ve gripped the reins of your life tightly in your own hands. I suggest you release them and turn them over to God. Come to His Son, Jesus. Admit where you are and express to him what you need. A simple prayer is all it takes to begin this life-transforming relationship with Him. I close with a simple prayer you may use to speak in the quietness of your heart to the One who longs to walk with you through the tough stuff of personal pain. Father, thanks for sending Your Son – the Lord Jesus to empathize with my pain. I know that I’m a sinner. I’ve made a royal mess of my life. I’m tire of the fight. I’m tired of the pain I’ve added to my life as if You didn’t exist. believing that You died for me and that You rose from the dead. I turn my back on my stubborn ways as I surrender all to You. Take the reings, Lord Jesus. I release them to You. I accept Your forgiveness, and I claim Your grace. As I repent of my sins, especially my idolatry in putting other things before You. and resurrection can save me, as I accept your gift of eternal life. Amen. 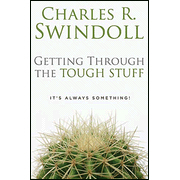 *The article above was adapted from the excellent book by Charles R. Swindoll. Getting Through the Tough Stuff: It’s Always Something. Nashville: Thomas Nelson, 2004. 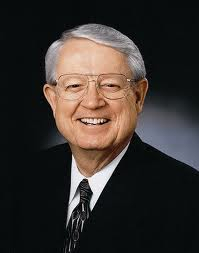 Dr. Charles R. Swindoll is senior pastor of Stonebriar Community Church, chancellor of Dallas Theological Seminary, and the Bible teacher on the internationally syndicated radio program Insight for Living.